This has been a quick week; although, I am not sure if I am ready for the weekend or not. As I mentioned earlier, we are having our hardwood floors re-finished, and we have to move everything out of the rooms. And, currently, they were predicting over a foot of snow where I live with up to 50 mph winds - a blizzard! Although, by the time the weekend comes - it will probably be down to less than an inch with no wind - that's how it goes around here. 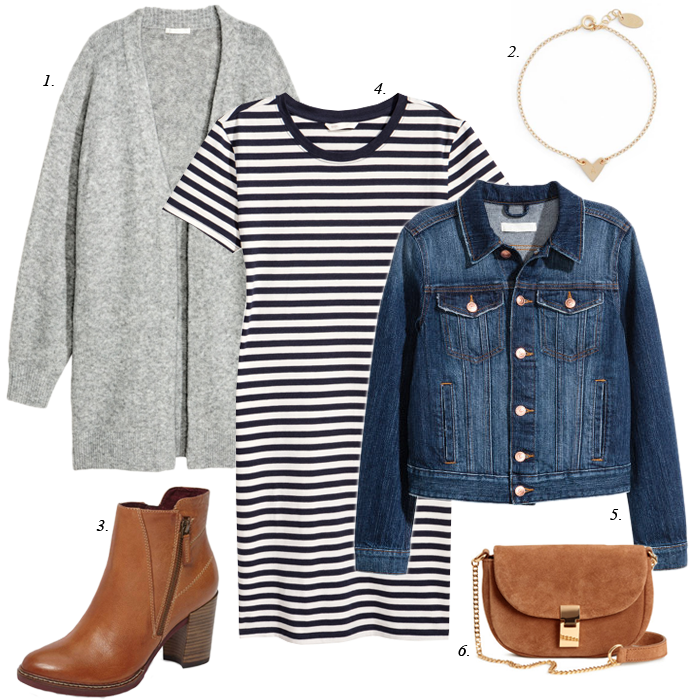 What do you think of this look - that striped dress is ONLY $8! Also, both the cardigan and denim jacket are on sale for $20, and the suede bag is $35. 1. I love the texture on this long blush cardigan that is under $50. 3. This $18 suede bag reminds me of the expensive Chloe ones. 4. This sweater is on sale for under $20. 5. I love this floral wrap dress - and it is a great price. 6. This tiered ruffle-like blouse is so pretty. 7. This pretty floral blouse is 40% off. 8. This MAC "glow kit" that makes you look more radiant is 40% off. 9. This eye shadow kit with 31 colors is 50% off. 10. This is the cutest leopard make up bag and it is only $6! Fabulous! Love how you styled an inexpensive dress and made it look so rich!